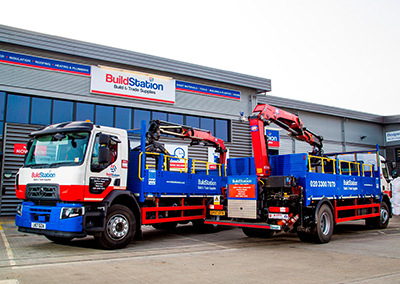 Just six months after it allocated its first Bevan-built crane truck to a new branch, Essex-based builder's merchant BuildStation has responded to strong customer demand by returning for another. Smartly finished in the operator's red, white and blue colour scheme, both vehicles are the subject of flexible BRS Contract Hire agreements and based on Renault Trucks C-chassis supplied by Norfolk Truck & Van Enfield. BuildStation was launched less than a year ago and trades from an outlet on the Viper Industrial Estate in Romford. So successful has the new venture proved that the company is now considering a second branch, for Rainham. The 26-tonne Range C2300 320 6x2 truck with tag axle commissioned by BuildStation has been flat out since day one, which explains why it has now been joined by a second vehicle, this time an 18-tonne Range C2300 250 4x2 on air suspension. BuildStation is using the two trucks to undertake deliveries to trade and private customers - the company stocks more than 10,000 lines, including building, electrical, plumbing and security products, and power tools. Manufactured at the Bevan Group's Oldbury and Wednesbury production facilities - the award-winning bodybuilder also operates from two other locations in the West Midlands - both have split dropside bodies. Bevan's patented Safe-T-Drop system is designed to eliminate any risk of a fall from height by operatives working on the vehicle bed. The impact-resistant Safe-T-Drop rails can be easily folded away for loading and unloading. Raising the dropsides is also quick and simple; they can only be closed with the Safe-T-Drop rails in place, ensuring correct use of the rails at all times. The trucks are also fitted with sub-frames for their rear-mounted, radio remote-controlled HMF 1420 14-tonne/metre cranes, which work with Kinshofer brick and block grabs. The Bevan Group is a strategic partner of Danish-owned HMF, whose premium brand products are renowned not only for their strength and durability, but also for their advanced safety technology - the BuildStation vehicles are specified with HMF's pioneering EVS (Electronic Vehicle Stability) system, which calculates the extent to which the load on the back of a truck can also serve as a counterweight, thus allowing the operator to maximise capacity while eliminating any risk of the vehicle toppling. In line with Bevan's 'one-stop shop' philosophy, its Graphics team applied BuildStation's livery to both trucks, as well as a 3.5-tonner fitted with Renault Truck Master's own, factory-built dropside body. Bevan Group was recommended to BuildStation by BRS, which celebrates its 70th anniversary in 2018. Bevan is an established supplier of similarly equipped trucks to some of the biggest names in the building supplies business - as well as minimising administrative hassle for its customers, it is able to complete vehicle builds to the tightest of schedules. BuildStation's Romford Branch Manager Vittorio Scoglio says: "Not only do we provide our customers with expert advice and great products at competitive prices, but we also commit to quick turnarounds and rapid deliveries of orders. "Our trucks are instrumental in enabling us to make good on that pledge. Both are exceptionally well built and perfectly specified for the job - given the Duty of Care we owe to colleagues, Bevan's Safe-T-Drop rails are a particularly impressive safety feature." He adds: "Our trucks operate predominantly within a 10-mile radius of base, although a recent assignment took one of them as far as Twickenham, in south-west London. They are entirely fit-for-purpose, and highly effective mobile advertisements as we continue to build our business and raise awareness of our brand."